H&M Foundation reveals "Foundation 500"
500 outstanding business leaders growing their companies in the harshest of startup environments. No, we´re not talking about Silicon Valley. 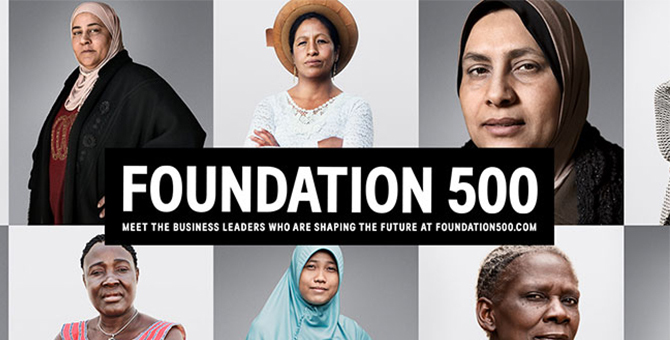 With Foundation 500 – a list of successful female business leaders from emerging markets – the non-profit H&M Foundation and humanitarian agency CARE want to challenge stereotypes and re-define what a business leader looks like. Why? It can help reduce poverty and achieve the UN Sustainable Development Goals on Women's Empowerment and Gender Equality. Launched today at www.foundation500.com, the list is a reference to the famous Fortune 500 list by Fortune Magazine. But the Foundation 500 reveals a different story. By presenting power portraits and stories of women entrepreneurs from emerging markets in the same manner business magazines usually portray male business leaders, H&M Foundation and CARE´s message is that empowering women is one of the most effective ways to break the cycle of poverty and create economic growth. Entire economies lose out when a substantial part of the population can´t realize its full potential. "The entrepreneur is the hero of our time, and it is estimated that over the coming years over 1 billion women will enter the workforce – a majority through entrepreneurship. But, you can't be what you can't see. Women rarely make the covers of business magazines, in fact the last time a woman was on the cover of Fortune Magazine was October 2014. With the Foundation 500 list we want to re-define what a business leader looks like," says Diana Amini, Global Manager at H&M Foundation. The Foundation 500 list includes the owner of West Ivory Coast's first bus company, a CEO from Indonesia growing her business by the means of Facebook and the President of a Peruvian Trout Farmers Association. The global public and media are invited to explore and share the stories, images and behind the scenes material available at www.foundation500.com. "Born with zero privilege, the women portrayed in the Foundation 500 list have made their own fortunes in the harshest of startup-environments. Yet, their stories often go untold. I wish I had seen women like these on the cover of business magazines when I grew up in South Sudan," said Alek Wek, British/Sudanese Supermodel, Entrepreneur and H&M Foundation Ambassador. The backbone of the Foundation 500 is the learnings from the Global Program on Empowering Women through Enterprise Development initiated by H&M Foundation and CARE in 2014. The women on the Foundation 500 list are part of this program, which in its first phase has reached over 100,000 women in Burundi, Côte d'Ivoire, Guatemala, Indonesia, Jordan, Nepal, Peru, Philippines, Sierra Leone, Sri Lanka, Yemen and Zambia. In Burundi, the average rate of increase in income among women in the program was 202,8%, the lowest being 104% and the highest 401%. Due to the success, a renewed three-year commitment is made. "From 2014-2020, the H&M Foundation pledges $14 million to support over 200,000 women entrepreneurs from emerging markets with seed capital and skills training to start and expand their businesses. If the world is to achieve the UN Sustainable Development Goals on Women's Empowerment and Gender Equality, the time to act is now," says Karl-Johan Persson, Board member H&M Foundation and CEO H & M Hennes & Mauritz AB.